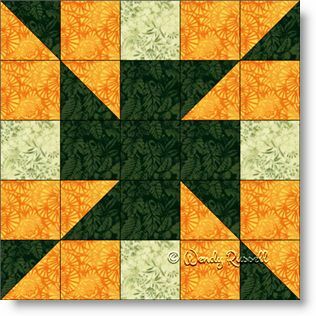 The Z Cross is the perfect block for a beginner quilter. It is made entirely of the most commonly used patches -- squares and half square triangles. Although this quilt block is technically a five patch (meaning it is created on a 5 x 5 grid), I found it easier to construct it as an uneven nine patch. However, please do not hesitate to construct it in rows, if that is your preference. I am always amazed when what appears to be a very ordinary block can create such an interesting secondary pattern when placed in the quilt. (Note how pinwheels appear when you place the blocks next to each other.) Needless to say I was really pleased with the resultant quilts I came up with while playing around with the layouts. Check out the sample quilts illustrated below.